You and your employees will spend at least 40 hours per week (and about 2,000 hours per year!) in the office. Why not make the best possible use of the space? Whether you’re moving into a brand new location and plotting to set up each room to maximize comfort and productivity, or your current space just needs a change, you’ve come to the right place to learn how. Reworking your office layout is more than just utilizing space efficiently. Studies show that office layout and other environmental factors affect employee well-being and productivity. Also, optimizing office layout is an effective to increase flexibility for workers, attract talent, drive culture, and enhance productivity and creativity, according to CPM One Source. Optimizing your office layout does involve furniture arrangement, but it also takes into account other factors, including type of furniture, lighting, open space, and decor. Here’s what you need to know about optimizing your office layout before you make any purchases. Before you start planning to install a slide and buy everyone treadmill desks, you’ll want to sit down and make a budget to see what kind of changes and updates are possible monetarily. Next, you’ll want to decide who is going to make the decisions. If you have enough money, you might consider hiring an interior designer; arranging the space yourself will be less expensive but likely more time-consuming. Finally, be sure you consider the individual requirements of your employees and company. You may want to poll or at least talk to your direct reports to find out what kind of space they want to spend their time in. Before you arrange the furniture, consider whether or not you should even keep it. Old or poorly made furniture can cause employee health problems such as back pain, carpal tunnel syndrome, migraines, and eye strain. Finding ergonomic desk chairs is a great place to start. Look for chairs that feature armrest variations; swivel mechanisms; height, width, and depth adjustments; lumbar support; and padded material. While updating furniture or opting for something more expensive might hurt your wallet on the outset, it will save your employees pain and healthcare costs down the road. Before you start unwittingly moving desks away from phone jacks employees need to access, set up a time to speak with your IT department or head of Engineering about how best to arrange the space so everyone can get to the technology they need. Consider factors such as location of printers, storage for technology, proximity to outlets, wifi routers, and space for projectors and screens. 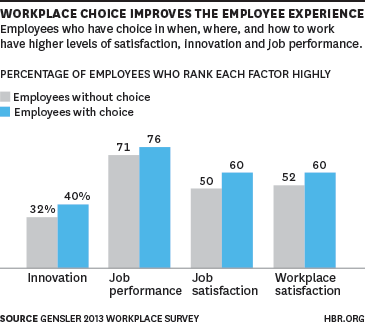 Research indicates that employees experience higher job satisfaction with they are allowed to control the setup of their own workspaces or choose where they want to work. This can mean letting your employees arrange the furniture how they want in their offices or order the type of furniture they want; or, it can mean giving them several options for workspaces throughout the office building. For example, one employee might like to answer emails in a private phone booth in the morning but venture into a shared space to collaborate with coworkers in the afternoon. Encourage your employees to walk to different parts of the office and enjoy space dedicated to collaboration. Collaborative spaces can be as simple as computers set up on tables where multiple people can gather or as comfortable as a few plush chairs in a semi-circle around a fireplace, indoor fountain, or art display. These spaces make great alternatives to just meeting in someone’s office. Lighting can impact productivity, health, mood, well-being, and depression. In fact, an American Society of Interior Design study indicated that 68% of employees are unhappy about the lighting situation in their offices. Take a stroll around your office and take note of spaces that are not getting enough light. Natural light is ideal, but this isn’t possible for all spaces, especially interior offices and cubicles. For these spaces, consider obtaining ceiling lights that imitate natural light or sunlight desk lamps. While office temperature might seem like a separate issue from office layout, it’s not. For example, the sun’s shining through a window might make one area too warm, while an air conditioning vent located directly over an interior cubicle might make that space too cold. You won’t be able to account for every one of these issues, but some awareness of temperature variation throughout the office may help you make smart layout choices. It might be tempting to jam as much furniture as you can into the space, but that can be visually overwhelming and make the office difficult to navigate. Think of this like white space on a resume. “Moderate levels of visual complexity are great: they give your mind something to do without being too busy or time-consuming,” says design psychologist Sally Augustin. Don’t be afraid to leave some spaces open and allow plenty of space for walking or gathering in a standing position. There’s nothing worse than a dark, bland office with no character or decorations. Try including some office plants, artwork, inspirational quotes, and company branding. However, be careful not to overdo it. Office decor should make the space look more aesthetically pleasing, not overwhelm employees and visitors. A critical consideration while planning your office layout is growth. How many employees do you plan on adding in the next 6-12 months, and where will you fit their desks? How will this extra foot traffic affect common spaces? Will meeting rooms be constantly booked? Organize your space with the future in mind so you don’t have to reorganize and redecorate out of necessity. While the occasional office reorganization is healthy and ideal, but doing it too often will get pricey and time-consuming.